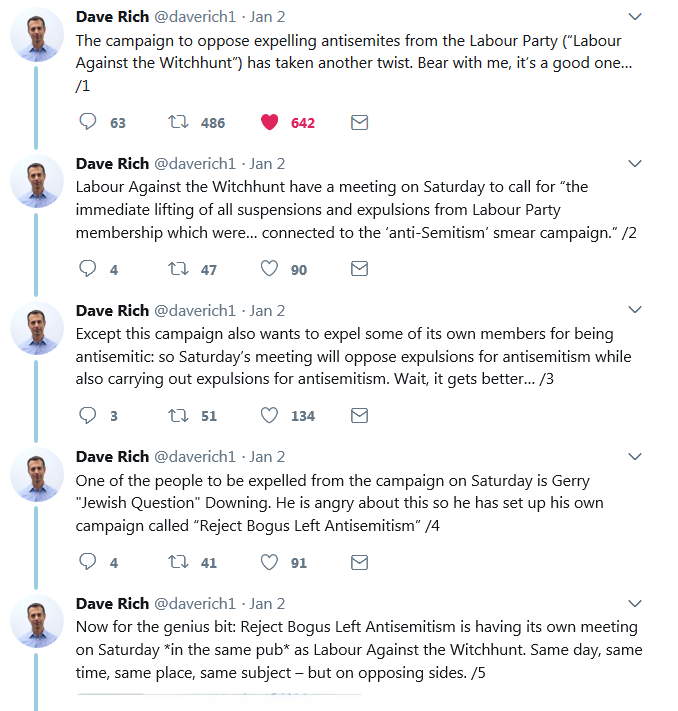 Antisemitism on the British Left is a story that does not go away, the gift (if that’s the right word) that keeps on giving. Over the last few weeks several items have popped up in the media and I give you a taste of them here. Let us strip the “they-of-all-people” argument down to its very basics: gentiles telling Jews that we killed six million of your people and that as a result it is you, not us, who have lessons to learn; that it is you, not us, who need to clean up your act. It is an argument of atrocious, spiteful insanity. Do not accept it; turn it back on those who offer it. For it is us, not you, who should know better. It’s interesting that Corbyn chose to quote the Bundist (member of the Jewish Socialist Party) Szmul Zygielbojm. I suppose the fact that he wasn’t a Zionist probably made him more attractive to Corbyn. Yesterday a two-hour debate took place in the House of Commons regarding the full proscription of Hezbollah in the United Kingdom. Currently the UK government has banned the “military wing” of Hezbollah, however they have allowed the so-called “political wing” to remain active. This distinction between the two wings is a fallacy. The organisation itself does not differentiate between the two. This division of the organisation was created by Western politicians in an apparent attempt to show they were “serious about tackling terrorism” while at the same time trying not to offend those same terrorist groups or the countries supporting them. Unfortunately, the UK government’s weak approach when dealing with Hezbollah has allowed the support for this terror organisation on the streets of the Britain. The Hezbollah flag is regularly seen in anti-Israel marches. The most notable being the Al-Quds march in 2016, where hundreds of flags were waved, sparking calls to ban the flying of the Hezbollah flag. We were excited to see this debate come about, and along with our partners, sent thousands of emails to politicians urging them to attend the debate and to support the motion. However, before the debate had even taken place, we heard the views of two of the political parties, and the forecast was not good. The Liberal Democrats showed that their party line was not to support the ban as they wanted to keep dialogue open. A flawed view in our opinion. Wes Streeting, Labour MP for Ilford North, said he was “dismayed” by the memo, and expressed his full support for the banning of Hezbollah. The debate itself was lively, informed and passionate, with MPs from Labour, Conservatives and the DUP all showing their support for the banning of Hezbollah. The consensus from backbench MPs was that Hezbollah was a terrorist group who should be banned in its entirety, without question. Despite 81% of the UK public supporting a full ban of Hezbollah. Despite all MPs involved in the parliamentary debate on the issue supporting the ban of Hezbollah. Despite high level military officials supporting the ban. 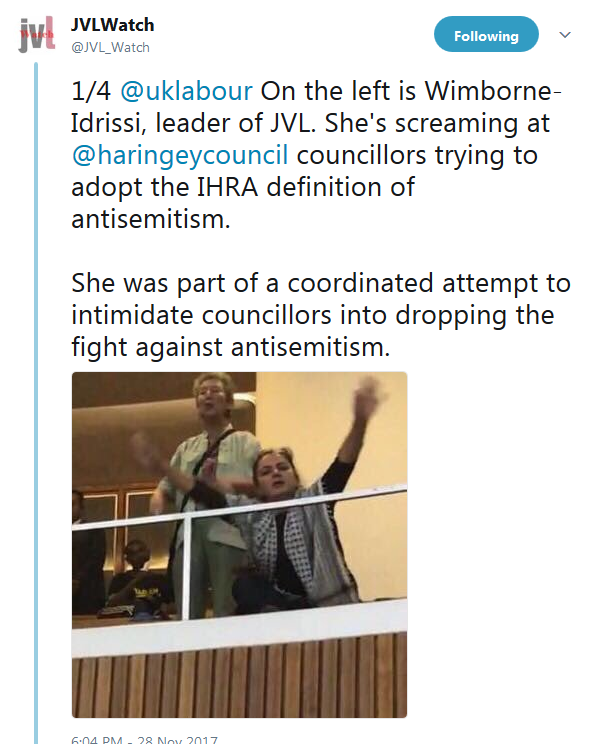 And despite the fact that Hezbollah is the most dangerous terror organisation in the world, which is hell bent on destroying one of our most cherished allies, Israel, and is responsible for killing Jews around the world, as well over 1,000 British and American troops in the Middle East – despite all of these things – the front benches of both Labour and the Conservatives have refused to support the ban of Hezbollah. The UK government’s response is weak, compromised, misguided and wrong. It allows support for the terror group to flourish on our streets, it compromises the security of our own people, and it strengthens the terrorist’s hands against our cherished ally Israel, all for the delusion that we can make peace with terrorists. The government must change its stance on Hezbollah. Shame on the Conservative Party! We hardly expected more from Labour but the Tories? It’s not only England which has an Israel problem. In fact Ireland has a much greater antipathy to Israel, particularly the “settlements”, aka Jewish homes in the Jewish homeland of Judea and Samaria. A private member’s bill proposed a full boycott of goods and services from the settlements (h/t Rob Harris) although the coalition was divided. The bill is being promoted by a number of BDS advocates, including Trocaire and Christian Aid. These NGOs have long-campaigned to sanction Israel as well as sabotage mutually beneficial trade agreements between Israel and Ireland. In an explanatory note circulated by Black, these NGOs note that the bill was specifically crafted to single out Israel. Shockingly, a handful of Israeli activists, some that serve on the boards of the New Israel Fund, have openly supported the bill. Israel protested at the bigotry and discrimination, and the Irish Senate froze the legislation, although they may yet return to discuss it. Beyond the revulsion I feel for the hatred spewed towards Israel from seemingly civilized countries, I find it amazing that such a tiny country like Israel should occupy so much space in people’s political consciousness. What is it about this tiny sliver of land, and the even tinier section called Judea and Samaria, which so enrages otherwise cultured and civilized people? Answers on a postcard please. And no hints from Holocaust Memorial Day. 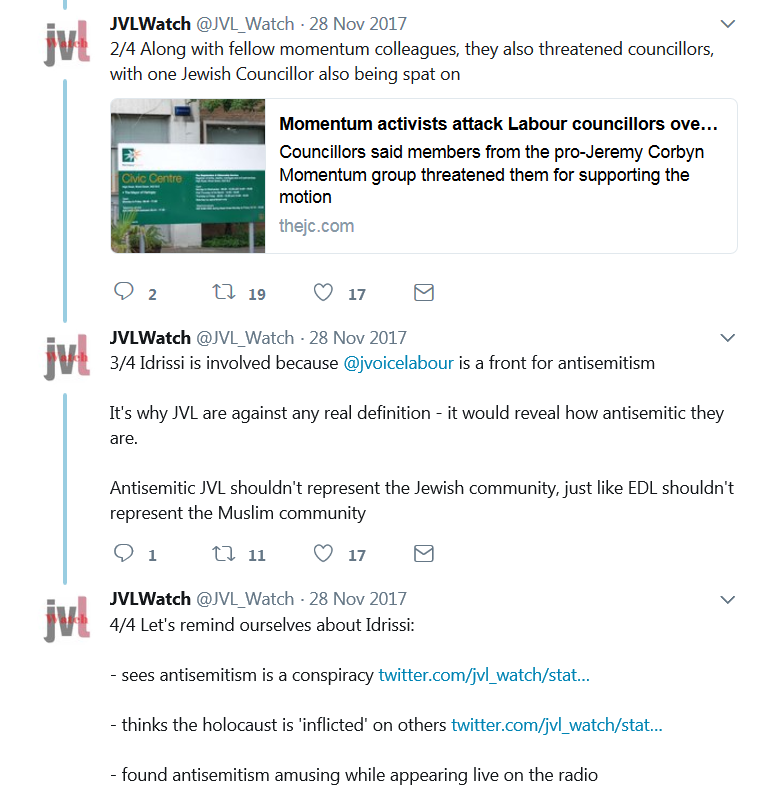 This entry was posted in Antisemitism, Boycotts and BDS, Incitement, International relations, Lawfare and Delegitimization and tagged anti-Zionism is antisemitism, antisemitism, Britain, CUFI, Hezbollah, Ireland, Labour Party, left, Momentum. Bookmark the permalink. The truly worrying thing is that the Tories seem to be in self-destruct mode and if this continues till the next election Corbyn and his accolytes will get into power. That’s when things will start getting bad for the Jews. One of the first things they will do is to ban shechita. To avoid offending their Moslem voters they will allow it after pre-stunning, which won’t worry most Moslems. But of course that’s the end of the matter for the Jews. Legislation similar to that of the Irish will make its way through the UK parliament and the result will be a significant downturn in trade with Israel and following that – in the political relationship with Israel. No great loss for Israel, but doubly uncomfortable for the Jews of Britain. And then, if they want to leave the UK, they may well have to cope with currency controls imposed by the incoming government to protect sterling from huge falls, due to market worries about Labour’s economic programme, which will turn the UK into an economic basket case. Which means they won’t be able to get their money out, and what is outside will fall heavily in value. So a reasonable person would say that the time for action is now. I think you’re being a bit pessimistic here although I do not discount the possibility that your scenario could occur. Even if Labour should G-d forbid get in, I doubt that they would institute such draconian laws, although you never know. Certainly the Tories are a huge disappointment. We had such high hopes with Theresa May. We thought she was Thatcher reincarnated, but just because she looks like her does not make her the same person unfortunately.